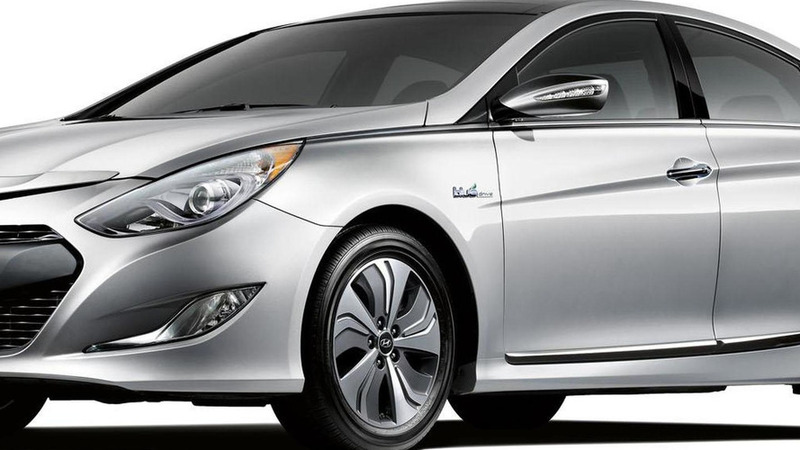 Hyundai has taken the wraps off the 2013 Sonata Hybrid. Looking virtually identical to its predecessor, the 2013 model has an upgraded powertrain with a 10.5 kW Hybrid Starter Generator, a 47 bhp (35 kW) electric motor and a more efficient 2.4-liter four-cylinder engine. The model also has an improved regenerative braking system and an enhanced lithium polymer battery pack which is lighter and stores more energy. Speaking of the latter, the battery's reduced size increases the trunk volume from 10.7 cubic feet (303 liters) to 12.1 cubic feet (343 liters). Thanks to these modifications, the car will operate in all-electric mode more often and for longer periods of time. As a result, the 2013 Sonata Hybrid has an EPA estimated fuel economy rating of 36 mpg city / 40 mpg highway / 38 mpg combined - increases of 2 mpg city / 1 mpg highway / 2 mpg combined (US). The 2013 Sonata Hybrid will go on sale shortly and U.S. pricing starts at $25,650 which excludes a $795 destination charge.